Shopping for a new Jeep Renegade? 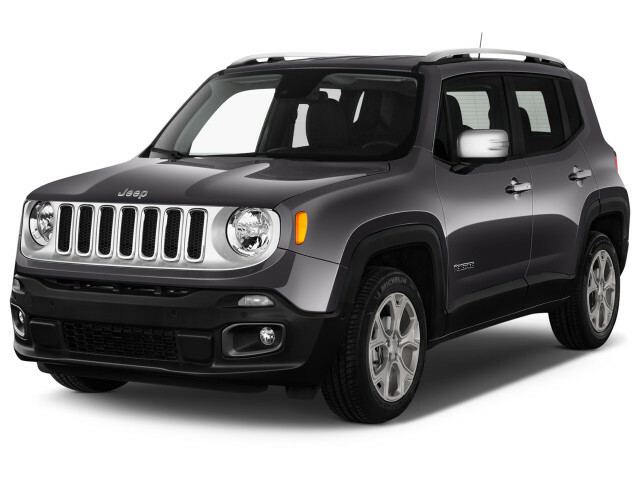 The base Jeep Renegade Sport presents a great value, if you can drive a 6-speed manual–but for advanced infotainment and safety, you’ll have to spend into the Latitude trim, at least. The 2018 Jeep Renegade is a compact crossover that stretches what we thought we knew about Jeep. 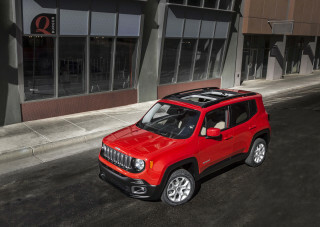 With its slab-sided, upright style, the Renegade weaves Jeep heritage into every body panel. The seven-slot grille and round headlights look more Jeep than does anything on the next-class-bigger Cherokee, and the details bring the look home. The “X” shape in the taillights? It’s a throwback to stampings on WWII-era fuel cans. Inside, the Renegade toughens up the usual economy-car shapes, puts big round knobs where they’re useful, and brightens things up with lovely textures and color choices. 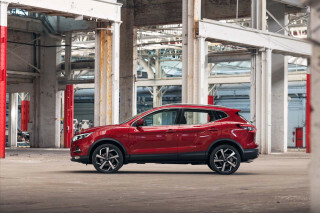 We prefer the base powertrain in the Renegade—a 160-horsepower turbo-4 with a 6-speed manual, and either front- or all-wheel drive—but know full well that the 180-hp inline-4 with its 9-speed automatic is far more common. 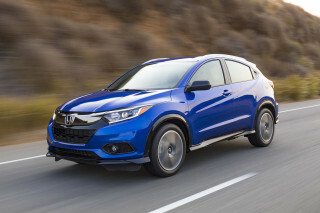 The base engine’s smoother and quieter, if more sluggish. The bigger engine kicks in more cabin noise to go with gutsier acceleration, but its transmission dithers and sometimes gets lost in all those gears. Fuel economy isn’t great, for all the complexity. On the road, the Renegade handles with the usual tall-wagon lean and with steering that’s no better than decent for on-road feel and response. Ride quality suffers with the biggest 18-inch wheels, but for a small car on a short wheelbase, the Renegade does well enough to consider as a daily commuter. Where it excels is in Trailhawk trim, where its all-wheel-drive system combines with a simulated low-speed crawl ratio, knobbier tires, and increased ground clearance, to cut its way through rutty mud paths and gravel passes, and can be spun into traction modes that anticipate mud, snow, sand, or downhill descents. Driver and front passenger will be comfortable, but the Renegade’s rear seat can’t carry more than two adults across. If they’re tall, those adults will press their knees against the front seats and their heads against the headliner or the large, optional twin-pane glass roof. Cargo space is fine, and the front passenger seat folds flat so the Renegade can carry longer objects. Crash-test scores have been below par, but the 2018 Renegade now has a standard rearview camera. Forward-collision warnings with automatic emergency braking are available. All Renegades come with power features and a rearview camera, but air conditioning is an option on the Sport. Latitude models have a 7.0-inch touchscreen infotainment system with Apple CarPlay and Android Auto, along with power features, cruise control, air conditioning, and Bluetooth with audio streaming. The Limited and Trailhawk come with keyless ignition, power heated front seats, and leather. Just shy of cute, the ruggedly appealing 2018 Jeep Renegade bristles with heritage flourishes. Built in Italy, smaller than any modern Jeep before it, the 2018 Renegade does a great job channeling the essential lines and attitude of the brand. It looks more like a real Jeep than the bigger Cherokee right across the showroom. The Renegade puts its Jeep shape through the uprights. It’s all vertical lines, from the windshield to the tailgate to the seven slots in its grille that carve out its identity–that and the twin round headlights. 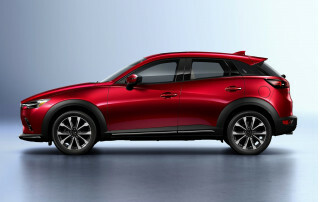 The wheel wells are squared off in a show of strength, but the Renegade’s shape abounds with tiny Easter eggs—surprising design touches like a mini-Jeep etched into the headlights, a Detroit skyline molded into a dash bin pad, the Xs styled into the taillights in homage to World War II-era fuel cans. 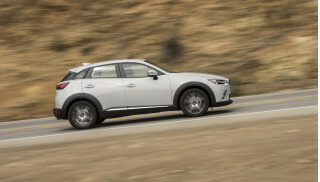 Differences are minor between trim levels. Sport models wear more flat black trim, while Limited models have a contrasting black roof, and Trailhawks have black wheels and lipstick-red tow hooks. The Renegade’s cabin translates the Jeep look into economy-car space well. It riffs on military cues too, from its oversized controls to its vertically aligned dash. It’s simple to acquaint yourself with the well-organized controls and to feel at ease inside the Renegade once you pick up all the humorous touches. The tach’s red zone ends in a spray meant to mimic a paintball splash, and with available parking assist, the display shows vintage 1940s Willys-Jeeps as the surrounding vehicles. The Jeep Renegade doesn’t possess great power or handling, but the Trailhawk excels off-road. Jeep fits a 1.4-liter turbo-4 to base Renegades. It puts out 160 horsepower and 184 pound-feet of torque through a 6-speed manual transmission. It’s a decently lively combination when configured with front-wheel drive, but that zesty feel fades when it’s saddled with all-wheel drive, which adds about 150 pounds. 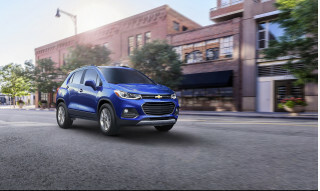 Most Renegades will be equipped with a 2.4-liter 4-cylinder with 180 hp and 175 lb-ft of torque. Coupled only to a 9-speed automatic transmission, it yields a vehicle that’s moderately quicker, but one that’s also more noisy to operate, and more ponderous on the road. The 9-speed hasn’t been ideally tuned in small Jeeps and in other Chryslers. We’ve driven many Renegades and have observed them as they hunt for gears and judder through some shifts. The Renegade comes in base trim with front-wheel drive, but all-wheel drive is one of the reasons we buy Jeeps. In the Renegade, the all-weather system is called Selec-Terrain. It launches the vehicle from a stop with all four wheels under power, then tapers the power from the rear wheels until it’s essentially a front-drive vehicle above 40 mph. The system can decouple the rear wheels for better fuel efficiency, but can clutch in the rear wheels when the vehicle’s systems sense wheel slippage. The system also has a driver-selectable set of modes that adapt the drivetrain to mud, snow, sand, or downhill descents. Ride and handling aren’t the Renegade’s best traits, but they’re acceptable for what’s essentially a tall-roofed economy car. There’s ample body lean in curves, and the electric power steering doesn’t offer much in the way of feedback. Still the Renegade doesn’t have a punishing small-car ride until it’s fitted with the biggest wheels and tires, and only large bumps (speed bumps included) upset its perky demeanor. Most Renegade drivers will use it in the city and suburbs, where its compact size and tight 36-foot turning circle will fit in tight quarters. The Jeep Renegade Trailhawk deserves special consideration if you’re shopping for a small vehicle with real off-road talent. With 8.7 inches of ground clearance, standard all-wheel drive, special bumpers for better approach and departure angles, skid plates, and with a Rock traction setting, it’s capable of climbing steeply rutted roads, and can crawl down 45-degree slopes. It doesn’t have a true low-ratio transfer case, but its lowest transmission gear can simulate a crawl ratio of 20:1. It’s no Wrangler, but the Renegade Trailhawk is capable of some impressive off-road feats, and feels at home doing them, partly due to a chunky 3,600-pound curb weight. The 2018 Jeep Renegade isn’t particularly spacious, and its back seat doesn’t keep its spec-sheet promises. A small cabin and lots of driveline noise put the Jeep Renegade below average in comfort and quality. The Renegade’s cabin seems wider than it is, a visual trick played by its flat door panels and tall door cutouts. The front seats have acceptable bolstering and shapes, and they’re comfortable for moderately long trips. But the Renegade’s overall length and all-wheel-drive hardware limit interior space. The back seat isn’t comfortable at all for two adults, and three people across in the back seat is a spec-sheet myth. The back-seat passengers shouldn’t be tall if they ride behind tall front passengers. If they are, they’ll find their knees press into the front seatbacks, though shoulder and head room should be fine. Behind the rear seat, the Renegade carves out 18.5 cubic feet of cargo space. The back seats fold down, and so does the front passenger seat on most models. That creates a long cargo space—ladders and the like will fit diagonally in the Renegade. With the rear seats down, cargo space expands to 50.8 cubic feet. Jeep engineers have molded in lots of small-item storage for mobile phones and the like. The space saved by an electric parking-brake switch has evolved into a lockable cargo bin, for example. The Renegade’s interior hits a sweet spot between cheap and cheerful, with soft-touch materials that mitigate some of the harder plastics found on the doors. Despite its height and blunt surfaces, the Renegade can be quiet to operate on freeways. Tire noise is an issue; concrete roads in our test vehicles have drummed up lots of in-car noise, and wind noise increases above 70 mph. The turbo-4 contributes its own whistling engine note, but in general, the economy-car sounds aren’t as pervasive as they might be. Crash-test scores hit the Jeep Renegade hard. The IIHS scores the Renegade as “Good” on most tests, but pegs it as “Acceptable” on the small-overlap front-impact test. 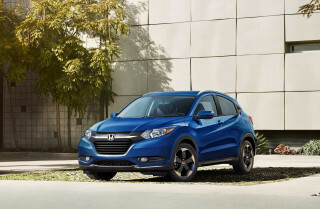 Its headlights are deemed “Poor,” and its child-seat anchors aren’t rated as easy to use. The NHTSA has worse news. In its most recent ratings, the Renegade earned a four-star overall rating. All-wheel-drive models get a three-star rating for rollover resistance. Both of those cost it a point on our scale. The Renegade gains back a point from last year, now that a rearview camera is standard on all models. Outward vision is good, thanks to a low beltline and squared-off fenders. To the rear, the thick roof pillars block some of the view, but the side mirrors help matters with their big, rectangular shape. The Renegade can be fitted with forward-collision warnings and automatic emergency braking, blind-spot monitors, and lane-departure warnings. The Jeep Renegade omits some key features in base trim, but can be outfitted to swank or rugged heights. The 2018 Jeep Renegade can be trimmed out in Sport, Latitude, Limited, and Trailhawk editions. Base prices range from about $20,000 to more than $30,000. From the Renegade Sport on up, all of these mini-Jeeps have standard power features, keyless entry, four-speaker AM/FM audio, a height-adjustable cargo floor, and 12-volt power outlets in the front and rear. The Sport edition does not come with air conditioning or cruise control, but this year, a rearview camera has become standard. The Jeep Renegade Latitude gets a 7.0-inch touchscreen audio system with satellite radio, Bluetooth with audio streaming, Apple CarPlay and Android Auto, and 16-inch wheels. The Limited model adds keyless ignition, a 115-volt power outlet, a 180-watt audio system, power front seats, heated front seats, leather, 18-inch wheels, and a split-folding rear seat. An 8.4-inch touchscreen with navigation is an option. Trailhawk Renegades get trimmed out to meet the expectations of off-road users. 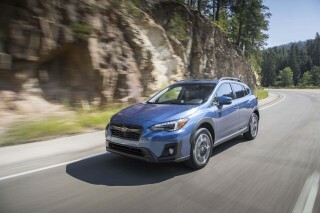 Its 9-speed automatic gets a simulated low-gear crawl ratio, a rock-driving mode, and a full-size spare tire, along with the mechanical and cosmetic changes listed above. Among the options on the Renegade’s order sheet, Jeep offers 17- and 18-inch wheels, air conditioning, leather, cruise control, and in-car wireless internet. It also offers a dual-pane glass sunroof with removable panels. Fixed or power-operated, they can be removed with a special Allen key and tucked away in storage bags, beneath the cargo floor. It’s some work, but gives the Renegade a more open-air feel. The 2018 Jeep Renegade sips relatively little fuel, though it isn’t the best in its class. Most versions of the Jeep Renegade earn more than 30 mpg on the EPA highway cycle, though they still lag some rivals. In its most recent ratings, the EPA scored the base Renegade turbo-4 with a manual transmission at 24 mpg city, 31 highway, 26 combined. The same ratings applied to both the front- and all-wheel-drive models. 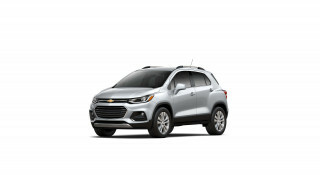 On Renegades equipped with the larger-displacement 2.4-liter inline-4, fuel economy checks in at 21/29/24 mpg with AWD and 22/30/25 mpg with front-wheel drive. 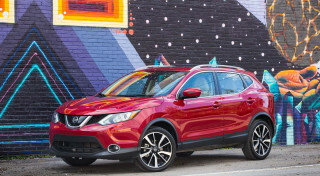 Those figures put the Renegade below rivals like the Honda HR-V, which has been rated at up to 31 mpg combined when outfitted with front-wheel drive and a CVT. We have just got one and we love it.the seats are comfortable and not all hard.runs excellent.the stereo is great.nothinh we dont like about it.the 4x4 is also very easy to use.